We are open and we ship orders Monday thru Friday from 9am to 5pm EST. IN THE ORDER THEY ARE RECEIVED. We process and ship out orders M-F - 9-5pm. 3 day UPS is shipped THE NEXT BUSINESS DAY. We use UPS. Please No P.O. Boxes. Shipping Price Estimates are available in the Shopping Cart. Orders over 150 Pounds cannot be shipped via UPS. You will be notified of this in your cart and a Quote will be provided in the cart. Call us ASAP to arrange a Return at 516.207.9682. You may return damaged or wrong items within 30 days of delivery for a full refund. We'll also pay the return shipping. 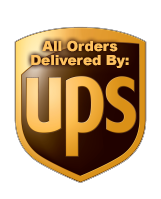 We will send you a UPS Return Label to your email. You should expect to receive your refund within four weeks of giving your package to the return shipper, however, in many cases you will receive a refund more quickly. This time period includes the transit time for us to receive your return from the shipper (5 to 10 business days), the time it takes us to process your return once we receive it (3 to 5 business days), and the time it takes your bank to process our refund request. If you need to return an item, please Contact Us ASAP with your order number and details about the product you would like to return. We will respond quickly with instructions for how to return items from your order. Shipping rates are determined by UPS. When you place an order, UPS will estimate shipping based on the weight & distance, not total price. To reflect the policies of the shipping companies we use, all weights will be rounded up to the next full pound. We are not open on weekends. We are open and ship 9 am to 5 pm, Monday - Friday - EST. Orders received over the weekend or on Holidays will not be processed until the next business day (usually Monday). Your order will be shipped as soon as possible M-F IN THE ORDER THEY ARE RECEIVED. We use UPS for shipping. UPS picks up daily at 4 pm. No PO Boxes please. After your package is picked up by UPS, You will get an email to your email Address with a Tracking link. The Tracking page will also give you an approximate Delivery Date & Time. We are not responsible for delays in shipping caused by UPS. We are not responsible for delays from UPS in delivery or delays in receiving Tracking Information. We use UPS for shipping. They do not deliver to PO Boxes.Your order will not be delivered if you specify a PO Box as a Shipping Address. We will attempt to contact you. After 5 days, if we do not get a response, your order will be refunded and you will be notified via email. Our website can give you a shipping quote, just enter the items you want to your shopping cart and when you are viewing your order, click on the "Estimate Shipping & Tax" link in Red. Tax is only applied in NY State. We are located in Hicksville, NY on Long Island. Orders over 150 Pounds will require shipping from a freight company. The Shopping Cart will notify you of this at checkout.